Home » Actor » Actress » Bollywood » India » Movie » News » Picture » Song » Update » Inspiration - Her Passion for Water Sports cured her Asthma. Inspiration - Her Passion for Water Sports cured her Asthma. 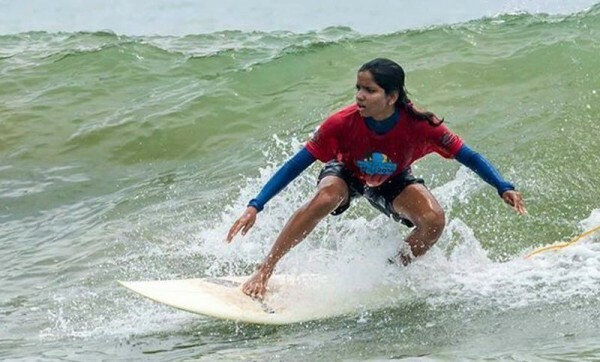 Tanvi Jagadish, this 17-year old girl from Mangalore is India's 1st Professional Female Surfer and Stand-Up Paddler. Coming from a place where girls are not encouraged to wear shorts and neither are they allowed to participate in water sports, Tanvi never gave up! She stood to her passion which made her the successful young surfer and stand-up paddler representing India in National and International surfing arenas. Born in Mangalore, Tanvi never thought that she could become a water sports athlete because of her asthma problem. Tanvi Jagadish was introduced to water when she was eight years old. Now, the water became her playground and her career. Initially, her parents didn't encourage her because of her asthma problem. But soon they realized that they shouldn't be the one who judges their child's life. To their surprise, the salt water and her sport cured her asthma problem. Tanvi then joined the Mantra Surfing Club in Mangalore, one of the few organizations offering training and opportunities for young people in water sports in India. She started training and has been participating in several competitions to improve her skills and her career. Tanvi's life changed when she met April Zilg, a Stand-Up Paddler from the northern California in the American SUP circuit in her visit to promote SUP in India. With her 1st victory in 2014 in the Indian surfing and SUP, she made her 1st step into her desired profession, and this triumph made her achieve greater heights in the water sport. Tanvi Jagadish is now studying at the Sharadha Pre-University College in Mangalore. She became successful in her career because of her determination, courage, stubborn nature and moreover, she broke the social stereotypes and achieved her passion with guts which made her the Indian's 1st Professional SUP racer and surfer. Life, like surfing, is all about wave selection and balance. So, never let the best waves in your life go by. Remember the fact that, the harder you work for something, the greater you will feel when you finally achieve it.